Georgette Heyer wrote meticulously researched historical-romance novels, specializing in the late eighteenth/early nineteenth-century, and was most famous for her Regency novels. She lived a sheltered childhood and at age 17, created a serial story to amuse her brother Boris, who was ill; their father asked her to prepare it for publication and his agent found a publisher for it -- this became The Black Moth (1921), about a disgraced young aristocrat who becomes a highwayman. 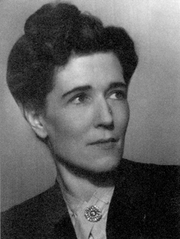 According to Georgette Heyer's biographer Jane Aiken Hodge, that first novel contained many of the elements that would become standard for Heyer's works, the "saturnine male lead, the marriage in danger, the extravagant wife, and the group of idle, entertaining young men." Beginning in 1932, Heyer released one romance novel and one detective thriller each year. Her books were highly popular both in the UK and the USA and she remains an enduring international bestseller, read and loved by four generations of readers. Georgette Heyer is currently considered a "single author." If one or more works are by a distinct, homonymous authors, go ahead and split the author. Georgette Heyer is composed of 19 names. You can examine and separate out names.